The lonche de pierna (center) is a torta stuffed with pork leg meat in adobo sauce. 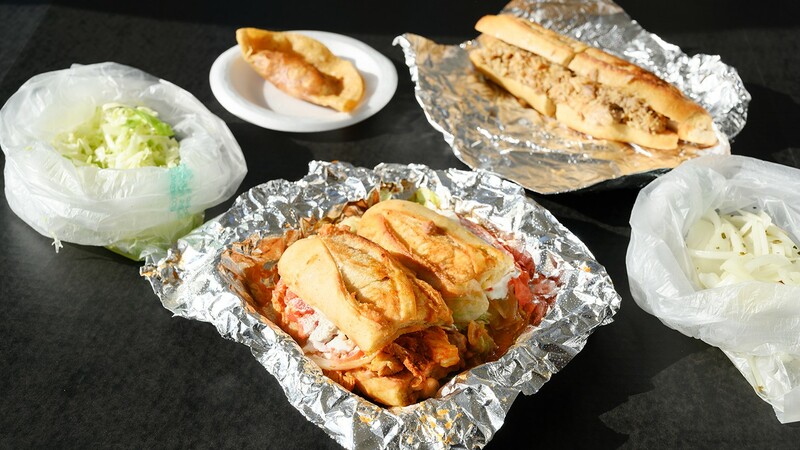 The menu at Tortas Ahogadas Mi Barrio takes up nearly half a wall of the restaurant, but most customers order only two things: the namesake torta ahogada and the tacos dorados. In fact, on weekends during lunchtime, you'll see groups of families and friends showing up — sometimes to lines outside the door — for these Guadalajaran specialties at the Fruitvale restaurant. As the cooks work non-stop in the open kitchen, they ladle spoonful after spoonful of red tomato sauce from an industrial sized-bucket over the tortas and tacos. Some customers go for a whole torta, while some get an entire plate of tacos dorados. Others split the difference with half a torta and a couple tacos dorados. But what I was most excited about was the carne en su jugo, which is only available on weekends. It's a hearty, meaty soup popular in Jalisco that's much more flavorful and complex than its name, which literally translates to "meat in its juices," might suggest. Carne en su jugo is often made by slowly simmering beef and pureéd tomatillos in bacon fat, so I had high expectations for flavor. Mi Barrio's broth had a robust flavor of beef and pork, accented by the tang of tomatillos and a squeeze of lime. Every spoonful was filled with pinto beans, generous chunks of bacon, and remarkably tender beef. Garnishes of sliced radish, diced yellow onion, and cilantro added bright notes of flavor and prevented the dish from feeling too heavy, while the warm corn tortillas served on the side helped round out the meal. I only had a couple minor quibbles: the soft bacon was served in the soup rather than as a crunchy garnish on top, as I've had it elsewhere, and the soup didn't come with avocado or grilled whole onions, as my favorite versions do. Nonetheless, Mi Barrio's carne en su jugo deserves a spot in your rotation of comforting winter soups like ramen, pho, and pozole. As for the namesake torta ahogada, "ahogada" means drowned in Spanish, and indeed, these tortas come drenched in a pool of tomatoey, slightly spicy sauce. I went with the carnitas option, which was juicy, savory, and tender. And Mi Barrio gets the bread right. It's got a thick, chewy crust and a salty, sourdough-like flavor that provides contrast to the richness and fattiness of the carnitas. I found that even when soaked in sauce, the bread absorbed the sauce's flavor without sacrificing the integrity of the crust. However, the sauce drowning the torta didn't quite live up to the expectations set by the meat and the bread. The cold, thin sauce had a slightly sweet tomato taste with a hint of acidity and heat, but the flavor and spice seemed mild compared to other tortas ahogadas that I've tried. Thankfully, the tortas come with a much spicier sauce on the side that punches up the flavor. When I tried the torta with a drizzle of spicy sauce and the oregano-heavy pickled onions on the side, the dish was much more flavorful and complete. After watching a man at the table next to me gleefully devour six tacos dorados in a row, I had high hopes for the dish. Here, crispy deep-fried tacos come filled with your choice of beans or potatoes, then topped with a pile of pickled onions and cabbage and drowned in the same red sauce as the torta ahogada. Eating these tacos requires a balancing act to keep the shredded veggies on top. I enjoyed the combination of the crisp taco combined with the crunch of the cabbage and onion, and the acidity of the pickled vegetables helped to cut the grease from frying. Like the torta ahogada, the tacos benefited from a spoonful of spicy sauce. But since the tacos sat under a heat lamp before serving, they didn't come out as hot as I would have liked. There are also tortas on the menu that don't come drowned, and those are worth venturing out and trying, too. I went with the lonche de pierna: a torta stuffed with pork leg meat in adobo sauce, then garnished with iceberg lettuce, tomato, onions, sour cream, and a smear of refried beans. I liked the way the cool, tangy sour cream contrasted with the rich, mildly spiced pork, and the beans added an extra hint of creaminess. It came served on the same chewy, thick-crusted bread as the torta ahogada, which provided added dimensions of texture. For those who would rather not get their hands messy with a torta ahogada, I found the lonche equally enjoyable. There are few better accompaniments to a torta than a michelada, and Mi Barrio makes a solid version. A bottled beer of your choice comes poured over ice into a refrigerated mug, pre-filled with Clamato and hot sauce and adorned with a spicy, salted rim. To my delight, the fishy flavor of the Clamato shone through, and the drink was refreshing without sacrificing taste. I was looking forward to trying the jericalla, a Guadalajaran dessert that's not easy to find in the East Bay. It's a creamy, eggy custard with a burnt top that's like a cross between flan and crème brûlée. Legend has it that a nun created the dessert at an orphanage in Guadalajara but accidentally left the custards in the oven too long, burning them. I liked the fact that Mi Barrio's custard wasn't too sweet, and hints of vanilla and cinnamon flavor added interest to the mild sweetness. Meanwhile, the burnt top added a pleasant touch of caramelization. Hours: Mon.-Sun. 9 a.m.-6 p.m.